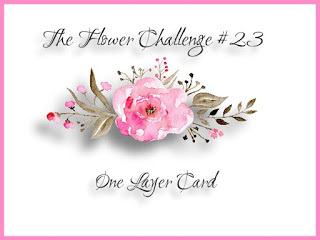 Today I have a card to share that I made for two challenges - Sunday's Featured Stamper challenge over at Splitcoaststampers and the April CAS Watercolour Card Challenge. 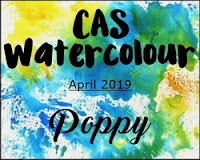 I CASEd a card of Angie's (stampinhappy on SCS) that had a poppies image on it and the CAS Watercolour challenge is to use poppies - so I hit two challenges with one card! 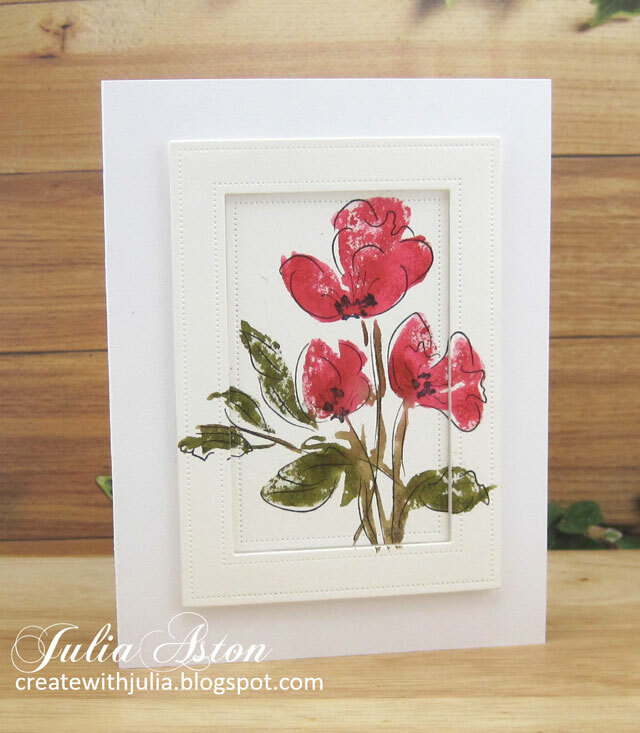 It seems I only have two poppy stamps in my vast array of floral stamps in my craft room!?? Today I used a two stamp set from Rubbernecker aptly called Watercolor Poppies for my card. I put the flower piece in my Stamp Platform and colored the areas on the stamp with Ranger Distress Markers -Festive Berries on the poppies, Forest Moss on the leaves and Gathered Twigs on the stems. I spritzed the stamp with water and pressed it against a panel of watercolor paper. I dried the panel with my heat tool and then positioned the outline stamp over the colored image, put the outline stamp on the Stamp Platform, inked it in black and pressed it over the panel. I die cut the panel using the medium frame from Pierced Feature Frames: Rectangles from PTI (they are presently on sale!). Then I layered the outer frame on foam dots onto a white card base and adhered the inside panel inside the frame. Accessories: Ranger Distress Markers Festive Berries, Forest Moss, Gathered Twigs, Stamp Platform - Tonic, water mister, heat tool, Pierced Feature Frames: Rectangles - PTI, foam dots. I'm madly making Easter cards to both sell at my church as well as send out to relatives and friends. Today I have a floral card (rather than eggs or bunnies) with an Easter sentiment, since in my part of the world, Easter comes at springtime! 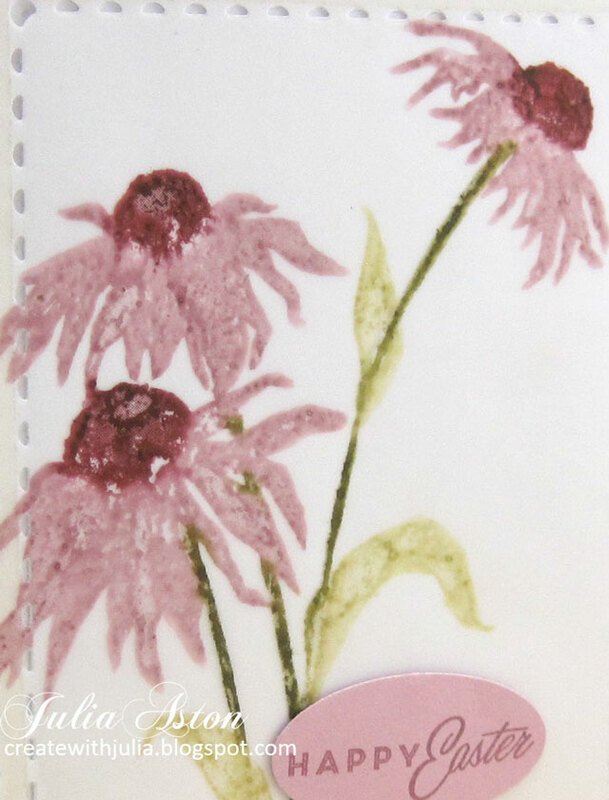 I used a watercolor technique to stamp my Dancing Daisies onto vellum. I placed the stamp in my Stamp Platform, colored over the stamp areas with 4 colors of Ranger Distress Markers (Victorian Velvet, Aged Mahogany, Shabby Shutters and Forest Moss), spritzed with water lightly (as I was stamping on vellum that obviously won't absorb the water!) and pressed it onto the vellum. I let the vellum panel dry, then I die cut the vellum panel as well as a white panel using Scallop Stackers: Small from PTI. I adhered the two die cuts together using 1/8" Scortape just around the outside edge and adhered that panel to a white card base. I stamped the sentiment from Easter Alleluias from PTI onto a punched oval and adhered that directly onto the panel. my sketch fits accept for the one daisy that goes off to the right! Accessories: Ranger Distress Markers Victorian Velvet, Aged Mahogany, Shabby Shutters, Forest Moss, Stamp Platform - Tonic/Tim Holtz, water mister, 1/8" ScorTape, oval punch - SU. 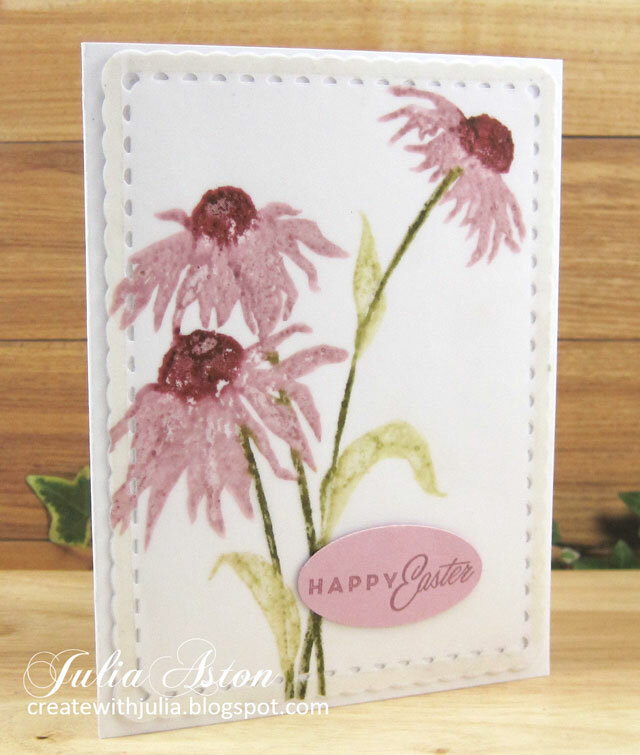 I recently purchased a lovely 3 piece stamp set from Rubbernecker Stamps called Gentle Breeze. I hadn't really looked at the stamp when it arrived - just put it in my floral stamp drawer to use later. On Saturday I participated in the Inspiration Challenge over at Splitcoaststampers where we were to be inspired by the All Posters Website (wow, what a lot of inspiration there!). and it made me think of my Rubbernecker stamp. So I got it out and created this card. 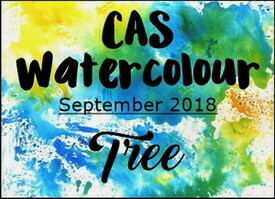 The stamp set has 3 stamps in it - the landscape piece, the tree piece and the grasses piece - so it's easy to get different colors on the different pieces. 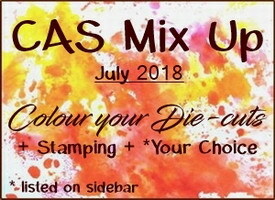 I decided to do a watercolor technique where I put one of the stamps in my Tim Holtz Tonic Stamp Platform (these stamps are red rubber but not on wood and you can use red rubber stamps in this platform.) 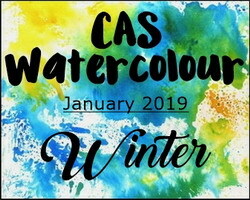 I colored the stamp using Ranger Distress Markers in the colors I wanted, spritzed the stamp with water and then pressed the stamp on a panel of watercolor paper. 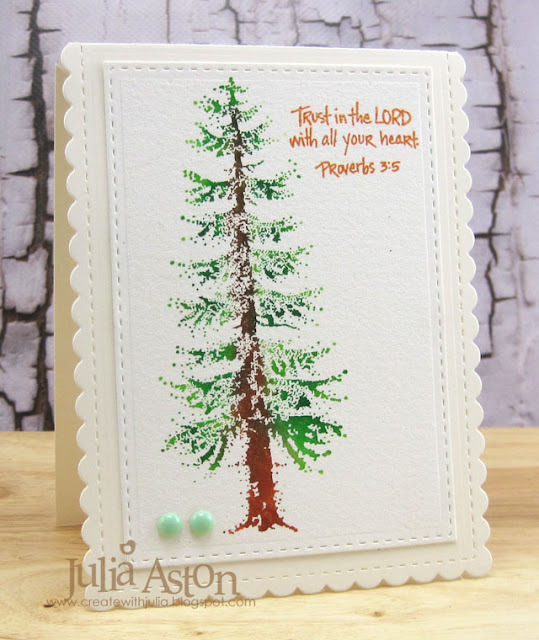 I repeated this with the tree stamp and the grasses stamp. The Distress Markers I used are Walnut Stain, Brushed Corduroy, Spiced Marmalade, Gathered Twigs and Peeled Paint. I die cut the panel with Pierced Feature Frames: Rectangle from PTI. I really loved how this came out and was eager to watercolor it again! 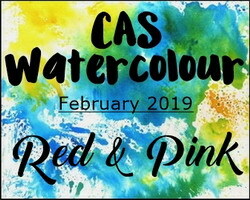 So I happened to check out the February CAS Watercolour Card Challenge and saw that it was to use Reds and Pinks. I thought I'd try these unusual colors with this stamp set and created a Valentine by adding 3 stamped hearts and a Valentines sentiment after I did the water coloring. 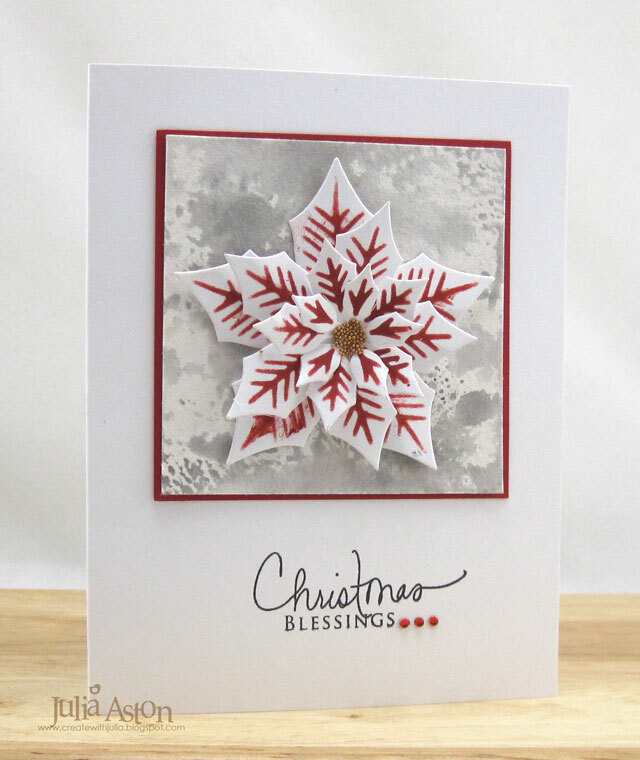 The Distress Markers I used on this card are Fired Brick, Worn Lipstick, Festive Berries, Spun Sugar and Aged Mahogany. 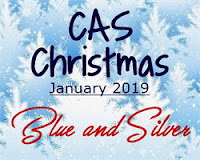 Today I'm playing along with two of Loll and Bonnie's CAS Challenges. I believe I hit both challenges with one card! I added silver Stickles to the tree (seen better on the photo below) and adhered the watercolor panel to a slightly larger metallic silver panel. 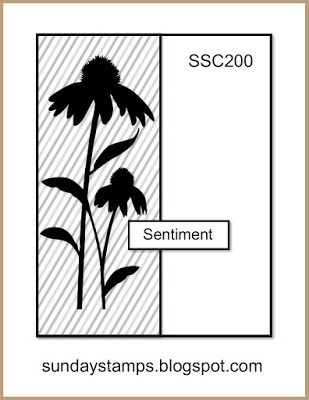 The sentiment sticker (Metallic Stickers Holiday Talk/Idea-ology) is silver on black. I placed my tree stamp (Christmas Glow from Penny Black - a purchase made after seeing Loll's beautiful card here) in my Tim Holtz Stamp Platform, inked it with Ranger Distress Salty Ocean, spritzed it with water and pressed it onto a panel of watercolor card. 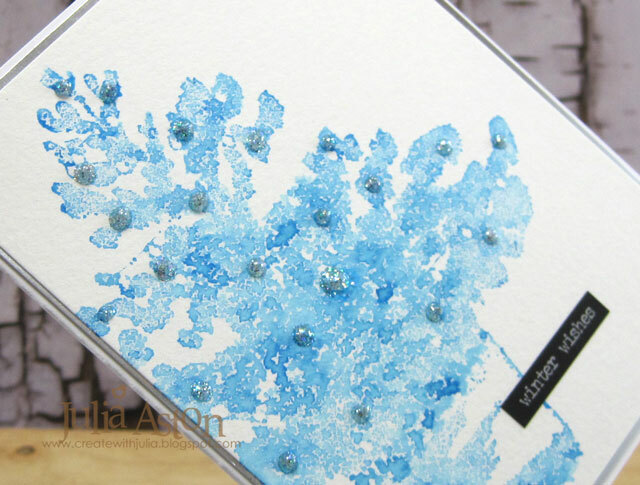 I dried it with my heat tool and added dots of Silver Ice Stickles and the sentiment sticker. This could be used for either a Christmas Card or a winter note - depending on what I stamp on the inside! I love the watery look of inking the stamp this way - now I need to try it with just straight inking to see how much detail it shows! Accessories: Silver Ice Stickles, Metallic Stickers Holiday Talk - Idea-ology, water mister, stamp platform - Tim Holtz/Tonic. I've got two Christmas cards to share today using a lovely new stamp set by Tim Holtz/Stampers Anonymous called Festive Overlay. (it's on sale today, Black Friday, over at The Funkie Junkie Boutique!) 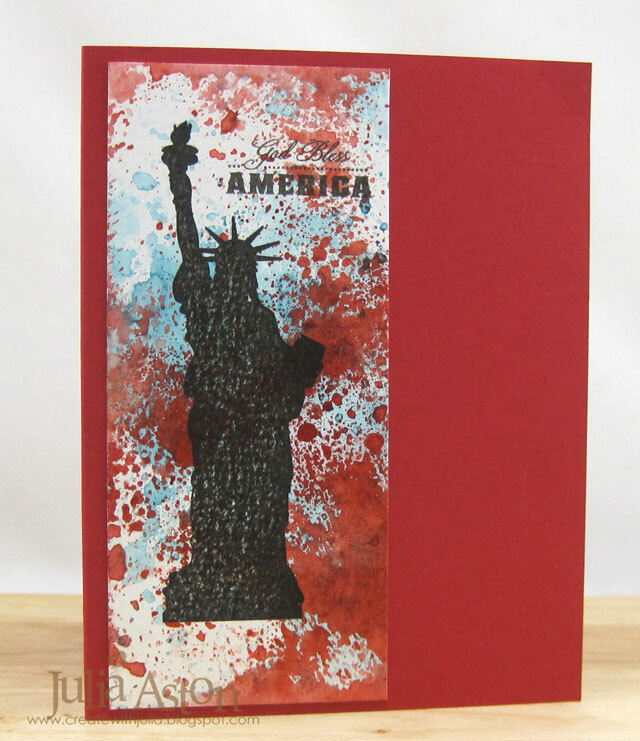 All the images look great stamped behind all the sentiments! 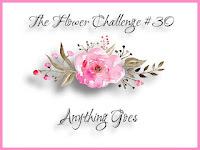 You just have to figure out a lighter shade of color for the image so the sentiment shows up over it! I used Pierced Feature Frames Ovals from PTI cutting them out of white paper and Birch Wrapping Paper. 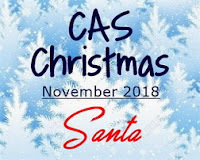 I stamped the Santa in Broken China DOX - stamping off on paper first so the ink wasn't too dark and then stamping on the card stock oval, and stamped the sentiment over it using Wendy Vecchi Archival Watering Can Ink. I made my second card using a wreath from the same stamp set - but instead of stamping it in ink, I colored the stamp with my Mowed Lawn Ranger Distress Marker, spritzed the stamp with my water mister and stamped it on the die cut oval. Two more for the Christmas box! I actually have enough cards made for this year already for my own cards but I sell some at my church as well so always good to have extra! 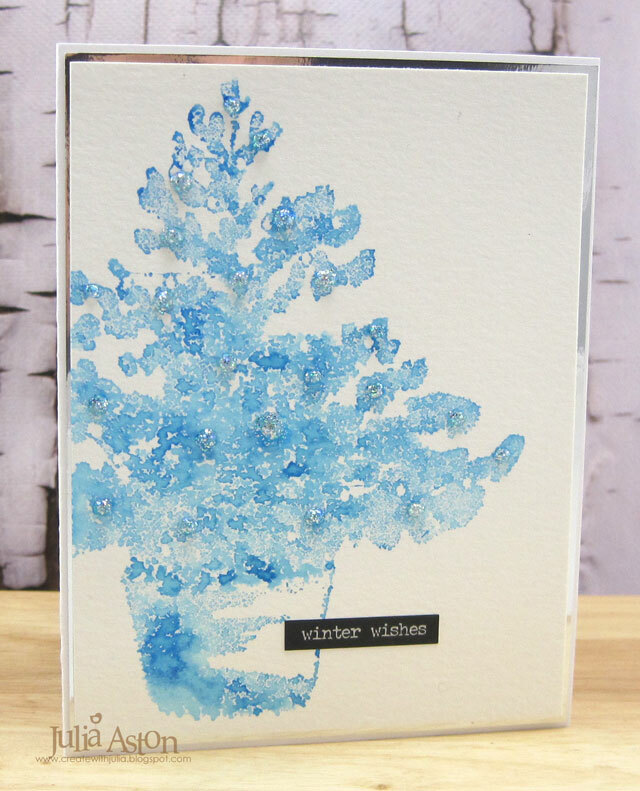 Stamps: Festive Overlay - Tim Holtz/Stampers Anonymous. Paper: White - PTI, Birch Bark Wrapping Paper - Pier 1 Imports. Ink: Ranger Distress Oxide Broken China, Wendy Vecchi Archival Watering Can and Red Geranium, Hero Hues Black. Accessories: Pierced Feature Frames Ovals - PTI, foam dots, water mister. 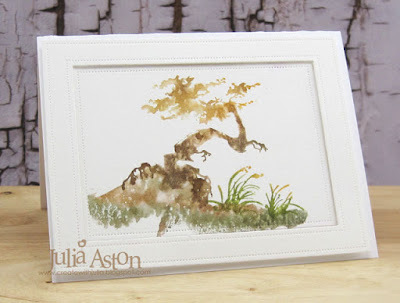 I found this older tree stamp from Stamp Oasis (Rubbernecker used to sell them) in my 'tree' drawer and I just had to ink it up - but I decided to do a watercolor technique of coloring the stamp with Zig Clean Color Real Brush markers (I used a light green, a dark green and a brown), spritzing the stamp with water and then pressing the stamp onto watercolor paper - and this is what happened! TOTALLY love how it came out! I die cut the panel and the card base using Noted: Scalloped A2 dies from PTI. I stamped the Proverb from an old Stampendous set called Inspired Verses using Wendy Vecchi Archival Orange Blossom Ink. To balance off the card design - I added 2 mint green enamel dots in the left corner. 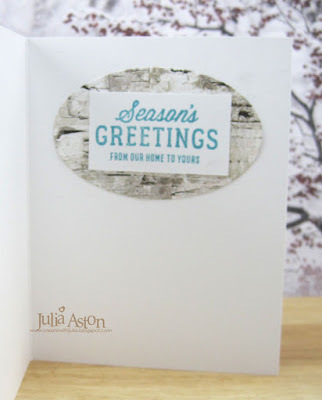 Accessories: Noted: Scalloped A2 dies - PTI, enamel dots, Zig Clean Color Real Brush Markers. 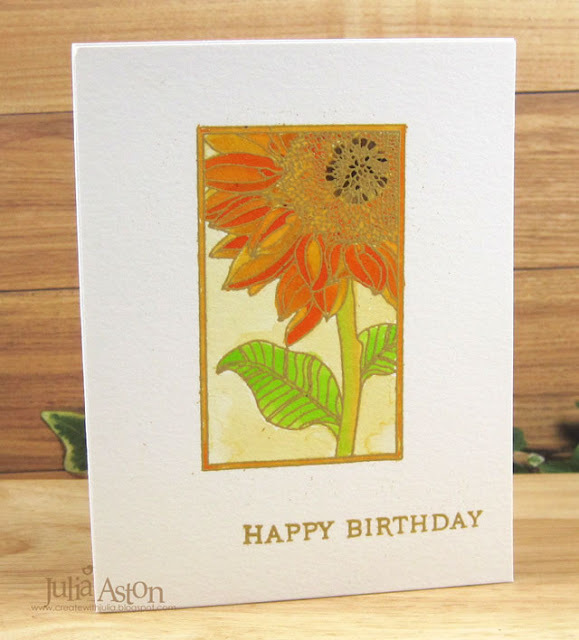 Today I have a summer birthday card with a lovely watercolored sunflower to share. I embossed the image with Tree Branch Embossing Powder to give it a subtle outline for my watercoloring. I watercolored with Ranger Distress Inks, rubbing each ink on my craft mat and dipping a wet brush into the color. I used Spiced Marmalade, Wild Honey, Scattered Straw for the flower and background and Twisted Cintron for the leaves. I used just a spot of Walnut Stain to color the center where the seeds would be! 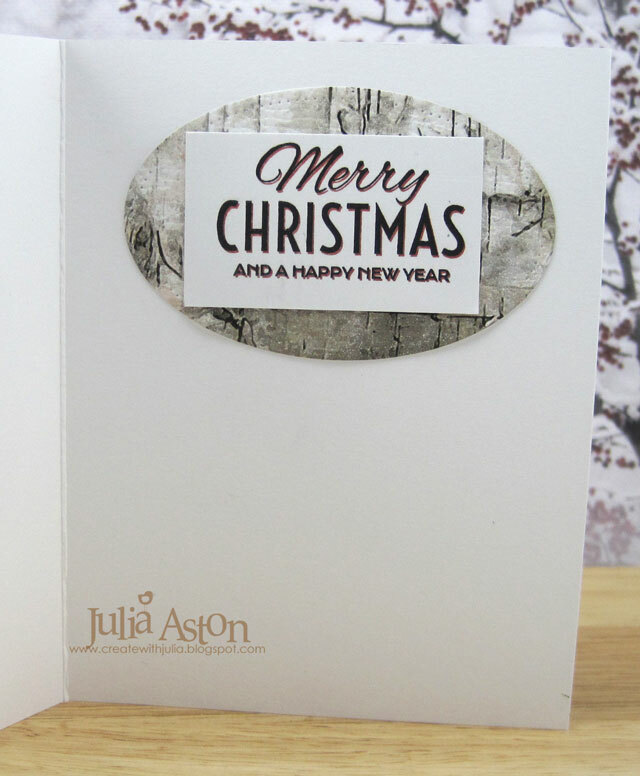 I also embossed the sentiment with the same Tree Branch EP. Ink: Versamark, Ranger Distress Spiced Marmalade, wild Honey, Scattered Straw, Twisted Cintron, Walnut Stain. 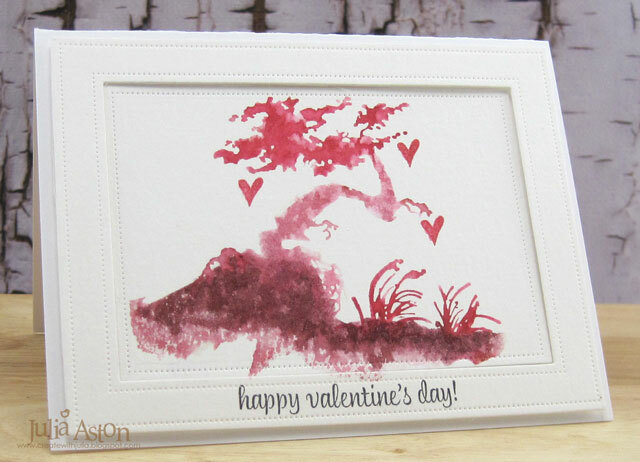 Accessories: Craft Mat, brush, water, heat tool, Wendy Vecchi/Ranger Tree Branch Embossing Powder. 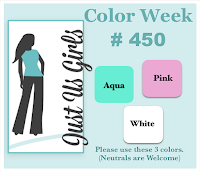 I'm back again as the July Guest Designer for Just Us Girls! 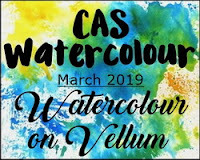 This week is Color Week and here is the challenge! 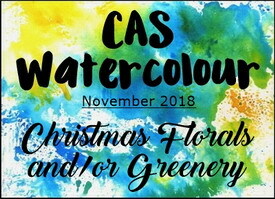 I often have trouble creating when I am told to use certain colors (!?) it can mess with my mojo! 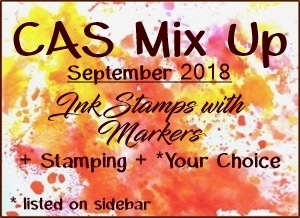 But this week was a breeze because I just got out the same stamps I used last week on my JUGS card since they are perfect for these colors! 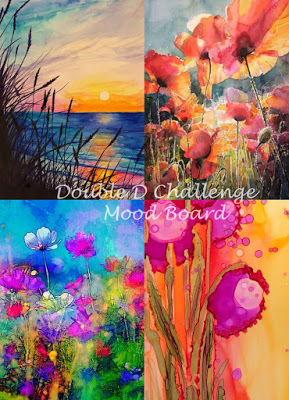 I cut a panel of water color paper, masked an area to create my section of 'ocean' and pounced the panel onto my craft mat where I had rubbed Ranger Distress Cracked Pistachio and then spritzed with water. When I had achieved the coverage I wanted, I removed the mask and dried the panel with my heat tool. To define the edges better, I drew lines with my 01 Black Micron Pen. 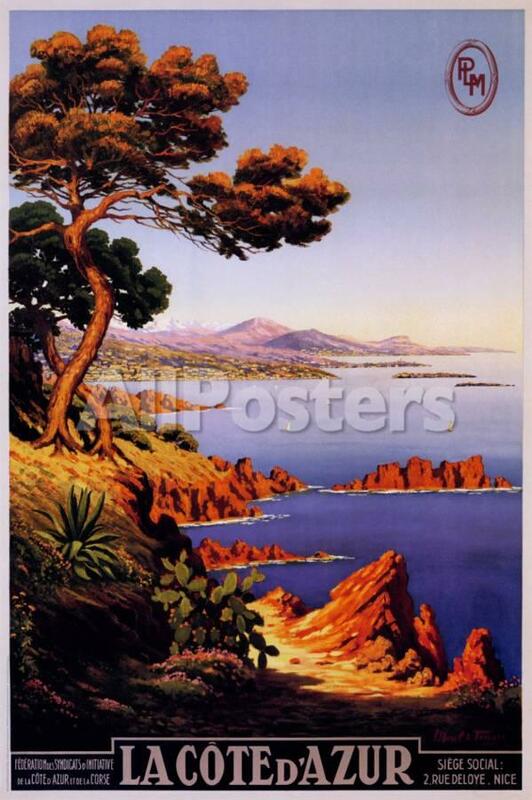 Then I got out the PTI Salt Air: Fauna and Salt Air: Flora stamps and dies. (The stamps seem to be back in the shop but the dies are still back ordered). I selected what fauna and flora I wanted and stamped them onto the die cuts using Pale Peony and Aqua Mist PTI Inks. 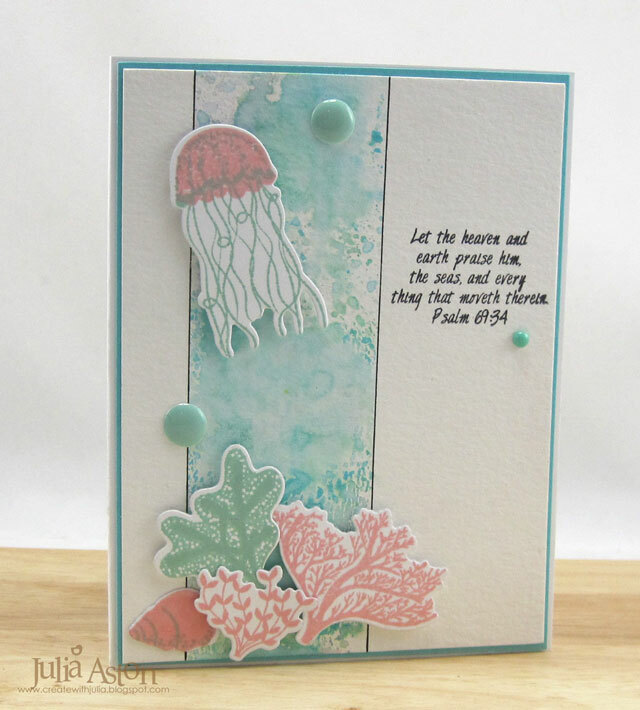 I layered them over the 'ocean' strip with foam dots, stamped the Psalm verse from an older Sweet N Sassy set called Beauty by the Sea and added 3 enamel dots. I layered the panel to a slightly larger Hawaiian Shores panel and then to a white card base. So being told what colors to use wasn't so terrible for me this time! I hope everyone is having a wonderful summer - getting outdoors and enjoying yourself - maybe even getting to the beach?! Looking at this card makes me want to go there! 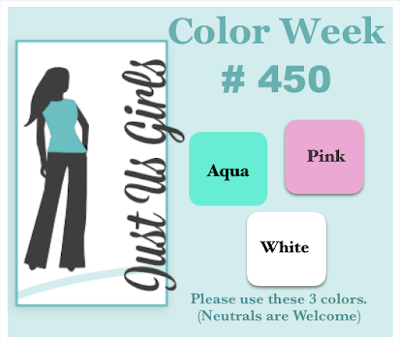 So please join us over at Just Us Girls showing us your creation using aqua, pink and white! 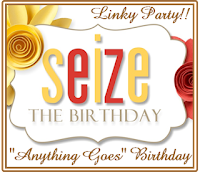 You have until 9 pm EST July 26th to link up your card. I'll be back next Saturday with my last creation as Guest Designer for JUGS. What a fun month I've been having creating along this talented team! Stamps: Salt Air: Fauna, Salt Air Flora - PTI, Beauty by the Sea (retired) - Sweet N Sassy. Ink: Hero Hues Black, Pale Peony and Aqua Mist - PTI, Ranger Distress Cracked Pistachio. Accessories: Eclipse Tape (for mask), craft mat, water mister, enamel dots, 01 Black Micron Pen, foam dots, Salt Air: Fauna Die set and Salt Air: Flora Die set - PTI. 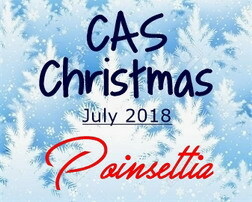 It sure is summer here in MA - we had quite a heat wave last week - what better time to make another Christmas card to try and cool off at least in our minds?! I used an older Nestability die set called Layered Poinsettias. I seem to have lost my foam mat that you need to use with these dies so that the leaves get embossed as you die cut them - so I die cut them and then sponged over the dies with Fired Brick Distress ink before taking the flowers out of the dies. I layered them over each other - the bottom two layers with foam dots. I added Copper Micro Beads to the center. 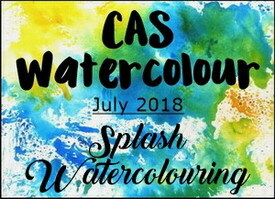 I made the background using the Splash Watercoloring technique which you'll find over at the July CAS Watercolour Challenge. I rubbed Ranger Distress Hickory Smoke Ink over my craft mat, spritzed with water and pounced my watercolor panel into the ink on the mat. My sentiment is from Signature Christmas from PTI. My box of Christmas cards is getting filled up! What a great feeling! Paper: White, Pure Poppy - PTI, Arches Watercolor paper. Accessories: Layered Poinsettia Dies - Nestabilities, Copper Micro Beads - Prima, water mister, craft Mat, Blending Tool, Tombow Glue, foam dots. Today we in the USA are celebrating our independence from Britain in 1776. The 4th of July - I hadn't thought to make a card - but it's 90 degrees F out and I've been staying mostly inside - no parades or fireworks outside for us today - we'll watch the celebration in Boston on TV tonight! So - since I was inside anyay - I suddenly thought I should make and post a card for the 4th! I used stamps from a retired Waltzingmouse set - USA 1776 and I made the background using Loll's Splash Watercolor technique video. I used Ranger Distress Inks Fired Brick and Broken China. 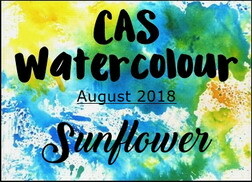 I'm linking my card to the July CAS Watercolor challenge. So Happy 4th of July to all those in the US - and Happy Canada Day on July 1st to all of my Canadian friends! 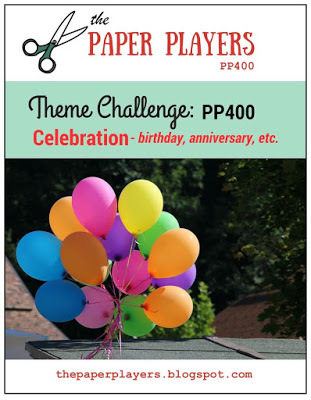 who are celebrating their 400th challenge! Ink: True Black - PTI, Ranger Distress Fired Brick and Broken Glass. Accessories: Craft Mat, water mister, heat tool, Misti.